So, you’ve heard that online content is important, but you don’t have the time or talent to write blog posts or produce videos. And even if you did, it would impossible to compete with national brands when it comes to Google search results, right? Actually, there are simple content marketing strategies you can use to top Zillow and Trulia in the rankings, and if you want to survive as an agent for the long term, creating content is no longer optional. It’s an important lead generation tactic you will NEED to compete. Trevor Mauch is the founder and CEO of Carrot, the top digital lead gen system for real estate professionals. Trevor and his team are dedicated to helping investors and agents leverage content marketing to rank well in Google, convert site visitors into leads, and nurture those leads into sales. To date, Carrot is responsible for generating three million inbound leads, 65% of which are organic. 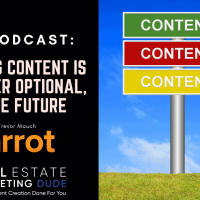 Today, Trevor joins me to explain how content creation helps real estate agents generate leads online and discuss how to use content to stand out as a specialist in a particular niche. He walks us through the process of identifying the keyword phrases people are typing into Google and creating hyperlocal content around those search terms that can compete with national brands. Listen in for Trevor’s insight on the EASY way to generate written content from a short video and learn to leverage the three different kinds of content to own the conversation in your market! Learn more Carrot at carrot.com and listen to Trevor’s podcast at https://carrot.com/blog/category/carrotcast/.